About two weeks ago, I gave a talk at GOTO Conference in Copenhagen at a very interesting .NET session organized by Mark Seemann. In my talk, I focused on the impedance mismatch between the data structures that are used in programming languages (such as classes in C# or records and discriminated unions in F#) and the data structures that we need to access (such as database, XML files and REST services). You can browse the slides at SlideShare or you can download them from GitHub in the PPT format. The source code is in my GitHub repository and can be downloaded as a single ZIP file. Expression scale - When using dynamic typing, the program specifies that some object is expected to contain a member (such as database column or XML node) of a specified name. The program also specifies the expected type of the member - for example a primitive type or another object. Program scale - The previous technique is local and is scattered around the code that works with data. When the data source is used in multiple places in the program (e.g. database), it makes sense to specify the expected structure and the mapping at once. This is used for example in LINQ to SQL (the structure is given by generated domain model). Internet scale - Describing the expected structure is reasonable if the data source is small. However, what if the program wants to access a data source with thousands of types? In that case, we need some automatic way for translating between the language used by the data source and the programming language. This is what F# type providers do. The first approach is to specify the structure locally at the expression level. In C#, this can be done using the dynamic type. In F#, similar thing can be achieved using the ? operator. The compiler translates expressions like obj?Foo to an operator call (?) obj "Foo" where the name of the member becomes a string. There are some interesting differences between the two approaches.. The snippet creates DynamicWorldBank instance, which supports dynamic invocation of operations. It is assigned to a variable of type dynamic, which allows us to write wb.Region even though the compiler cannot verify that there is such member. At runtime, the name Region is mapped to a web service request. The example also uses C# anonymous types to specify additional arguments for the call. Anonymous types are handy, because they can be used to specify both the name of the argument and the value. The call will be translated to a web request to an URL like http://api.worldbank.org/regions?per_page=100. The result of the call is some XML document that can be also accessed using the dynamic typing. The expression regions.Regions.Region returns a collection of all <region> elements nested in the root <regions> element. The member access reg.Name.Value gets the textual content of a sub-element named <name>. The dynamic access to XML elements is implemented using a fairly simple dynamic wrapper named DynamicXml that is built on top of the LINQ to XML library. When you perform any operation using the C# dynamic type, the result will always be of type dynamic. The F# dynamic operator works differently - it is statically resolved to some ? operator that has a well-known return type. You can see that by exploring the types in the above snippet (using tooltips). The type of options is seq<Row>, which represents a sequence of rows obtained from the database. The Row type also provides the ? operator, which can be used to read individual columns. The return type of this operator is a generic type parameter and F# type inference specifies the type argument based on the context. When assigning the result of row?ID to a record field of type int, the operator is called with int as a type argument and so it can cast the column value to the right type. This nicely reduces the boilerplate code that needs to be written, because casting is inserted automatically. In the previous examples, the structure was specified when accessing individual elements such as methods of the World Bank, XML document elements or database columns. However, we can also specify the structure all at once - by defining classes that represent the data and annotating them (e.g. using .NET attributes) to describe how to build the classes using the data. This approach is used, for example, by LINQ to SQL - the (generated) classes come with attributes that specify how to map database data to .NET objects. However, the same idea can be used for accessing any data source. In my earlier blog post, I used this for calling PHP code from C# using Phalanger. Anyway, I used two other F# examples in my GOTO talk. First, let's revisit the example with accessing databases. Look again at the previous snippet that creates a value of the PollOptions type from the row object loaded from database. The snippet seems quite redundant. It just dynamically assigns columns of a row to fields of record with the same name. In fact, the record type PollOptions fully specifies the structure that we want to get! The snippet shows two functions. In both of the declarations, the return type is specified explicitly using type annotations. The first function returns a sequence of PollOption values, while the second one just updates the database and returns unit. If you look at the type of the ? operator implemented by the DynamicDatabase type used in this example, you'll see that it takes string and returns a generic function 'T -> 'R. The type for both of the parameters is automatically provided by the F# compiler. The type of the argument was just unit (in the first example) and int (in the second example). The return type is the same as the return type of the function (specified using type annotations). The implementation of the ? operator uses the type argument 'R to decide what it should do. When the type is unit, it simply calls the stored procedure without returning a result. The second case is more interesting - when the return type is seq<SomeRecord>, the operator matches the data obtained from the database to this type. It enumerates over the returned data set and creates SomeRecord values from the data. In this case the record type PollOptions specifies the structure of the data and the library coerces the result set from SQL database to this structure. The first three declarations specify that title, link and description are simple XML elements (for example <title>) containing text. The name of the discriminated union case corresponds to the name of XML element. The <item> element contains three other elements, which is expressed using union case with multiple arguments. The Channel type demonstrates another feature - it is possible to use the F# list type to express the fact that another item can appear repeatedly as a child element of some XML element. The above example didn't answer why we used discriminated unions in the first place. The reason is that some elements may contain one of several different elements. For example, a <div> element in XHTML may contain <p>, <h1>, another <div> or many other different elements. These can be represented as multiple cases (see the sample source code for a complete example). 4:   let url = "http://feeds.guardian.co.uk/theguardian/world/rss"
The parsing of XML documents into a structure defined using F# discriminated unions is implemented using the StructuralXml.Load method. The method has a type argument that specifies the target structure. We didn't write it explicitly, because the result is then assigned to a pattern that involves the Rss(...) constructor, so F# infers the type from the context. Once the snippet transforms XML document into the required F# Rss type, it is quite easy to transform the value to the Listing type. The snippet iterates over all the Items (corresponding to XML <item> element) and creates a sequence of triples containing article title, link and a description. The approach discussed in the previous section relies on the fact that the developer defines the expected structure of the data (using some C# or F# types, possibly with .NET attributes or other hints). In some cases (e.g. LINQ to SQL), this structure can be generated by a tool, but it still needs to be there. There are two problems with this approach. Firstly, explicitly declaring the structure may be a bit tedious. Secondly, some online data sources simply have too many types - a web service dictionary may contain types for thousands of web services and each of them has several types. The solution that will be available in a future version of F# is called type providers. The idea is simple - instead of declaring the types explicitly, we can create a plugin that tells the F# compiler what would a .NET representation of the data source look like. The Visual Studio IntelliSense can then display these (fake) types as if they were real types and they can be used to write F# program just like ordinary types. When the program is compiled, the F# compiler calls the plugin again to deal with these types. The plugin can replace their uses with some other F# expression or actually generate real .NET types. The type provider is a .NET assembly (Samples.WorldBank.TypeProvider.dll) that contains a plugin for the compiler. Note that it doesn't actually contain any types that are used in the snippet - instead, it generates them based on the data it downloads from the World Bank. The type provider generates types in the WorldBank namespace. The snippet first uses a type WorldBank.Countries that contains all countries known to the World Bank as static members. The snippet creates a list containing some of the countries. The country value has a large number of properties that represent individual indicators that the World Bank provides. The number of indicators is incredible (about 4 thousands), so imagine generated (or even handwritten) class that needs to be included in every assembly that uses the World Bank. The type provider used in this example creates a fake type with all the properties (see screenshot below), but when you actually compile your code, the type will be replaced with some simple representation. 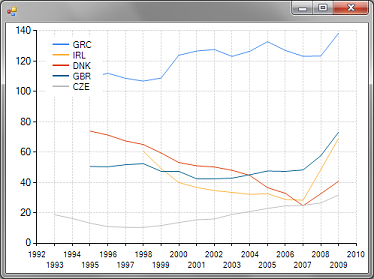 After getting the debt data, the snippet uses the FSharpChart library to generate a chart. It creates a list of line charts using FSharpChart.Line and combines them into a single chart using FShparChart.Combine. Then it calls a couple of With functions to configure the chart. In particular, it adds a legend and specifies the color of grid lines. Using C# dynamic type or the F# ? operator to specify the structure locally. Describing the structure using classes or F# types and mapping data to the structure using reflection. Generating types automatically using F# type providers (from the data or external schema). The source code for examples that demonstrate the first two techniques are available in the GitHub repository. The example showing how to access World Bank data using type providers will be released as soon as Microsoft releases some beta of F# with type providers. specify that case names should be treated as lower case.